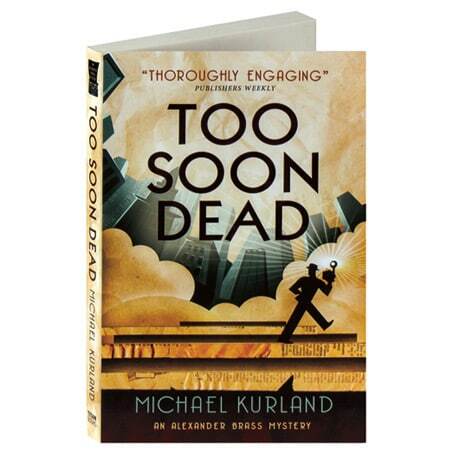 The creator of the Edgar-nominated Professor Moriarty mysteries, Michael Kurland here gives us the first in another witty series, set in 1930s New York City, where newspaper columnist extraordinaire Alexander Brass needs a good story. The saga begins when a furtive tipster promises an explosive story and gives an envelope to Morgan DeWitt—assistant to New York World celebrity newsman Alexander Brass—filled with photographs of a most compromising nature. When another World reporter on the story turns up murdered, Brass and his team resolve to find the killer, running a gauntlet of blackmailing Nazis, accommodating nymphomaniacs, and U.S. senators along the way.